The bell goes to pause the fight, and one boxer slumps in the corner, blood flowing. His cutman carefully applies what looks like Vaseline to the open cut. But as the fighter winces and the blood stops, it’s clear there’s something else in there. 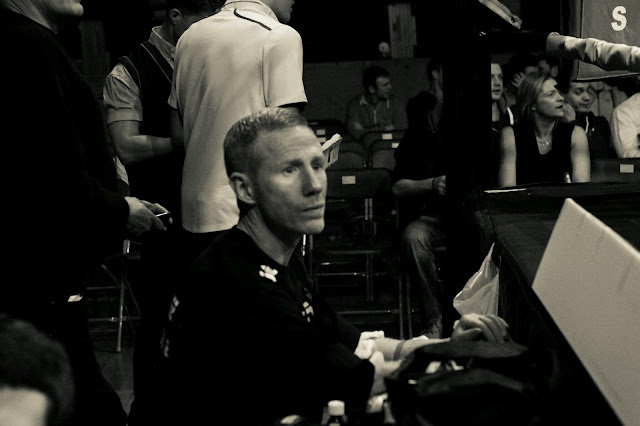 Joseph Clifford’s journey to cutman training started when he realised that mixture was as likely to be Superglue as adrenaline. Now running Ireland’s only course, he’s set to gain European recognition in June when the first Europe-wide conference takes place in Belfast. The role of the cutman is swathed in mystery but Clifford says it just comes down to hygiene and medication plus a good understanding of common injuries like concussion. “When people come to the course, they think it’s just about cuts. And you do get individuals who think the Holy Water and a “how’s your father” will get the fighter back in the ring. “But really it’s about hygiene, stopping cross-contamination,” he says. With the sun beating down on a glorious day in Wicklow, his stories of the damage an ill-prepared cutman can do put a cloud on the day. He has seen the infamous Superglue fix-up, but also bloody swabs tucked behind an ear and then rubbed over the cut again, bare hands holding bloody mouth-guards before shoving it into someone’s mouth. He also mentions bloody ice-buckets shared between fighters, and cotton swabs casually hanging from baseball caps as people go about their work. He’s been running the course since 2008, and has even graduated 12 female cutmen (the language hasn’t moved on, get over it) to add to his stable. “Promoters have been very positive in general, although there are those who see it as an added expense. But if the fighter gets cut at a title fight and the cutman keeps him in the fight, then that’s the proof,” Clifford says. He explained paramedics and doctors are there for serious injuries, they have no sporting interest in the fight. But cutmen tend to be coaches or former fighters – people who understand that when it’s medically safe to do so, all fighters just want to box on. “It’s not to keep the fight going at all costs. We are not going to lift some guy off the stool and throw him back in again. If he is all over the place, then that’s it,” he says. Clifford’s own background in health science led him to understand keeping fighters going is as much about science as stopping blood. He says there are different dosages of allowable drugs depending on the relevant Commission, but many untrained people just aren’t sure how to administer them. Adrenaline is the drug which first comes to most people’s minds – the quick shock to the system that temporarily stops bleeding. But how much do you use? Clifford says students on the course learn what and when to administer, and what other drugs can be just as useful. Correct dosage is also a pretty vital skill. So what about that superglue? He laughs, says it’s hard to believe but logical in some perverse way. Monsel’s Solution by the way was banned internationally in the 1940s but that doesn’t seem to have reached everyone’s ears. Clifford says at the end of the day, cutmen want to stop bleeding but some injuries only show up after the fight so they need these extra skills. Many boxers only show serious signs of concussion or even paraplegia hours after the fight. There may or may not be a doctor around but the cutman is right there or at least at the end of a phone. It’s this dedication to detail which caught the eye of Frederico Catizone, head of the International Cutman’s Association. He is travelling to Belfast on June 16th to see a course in action, and assess it to set a new European standard. One of the changes Clifford is bringing in is including women on his training panel – not something that’s really been seen before in Ireland. “It is one thing to do the cuts as a man, but as a female demanding the respect is harder. People have never refused a female cutsman but let’s say there has been reluctant participation at times. “Men will jump on the first mistake women make so I say to the girls: ‘don’t ask for respect, demand it’ and they’re fine,” Clifford says. WHAT DOES IT TAKE TO BE A CUTMAN? So what does it take to be cutsman? It’s all about the personality apparently – firm, friendly and fair. And just a few other things as well; Clifford lists his Four P’s – preparation, professionalism, personality and punctuality. The atmosphere in a ring or cage is charged, tempers are tight and can easily snap. So the cutman has to stay calm, this is especially important on MMA shows where the cutman works with all the fighters in one corner. Clifford says: “If you jump in the ring and have too much intensity, that makes people uncomfortable. And also if you see a bad cut and show by your reaction that you’re scared, it’s not good. This article first appeared in the June 2013 edition of Irish Fighter. 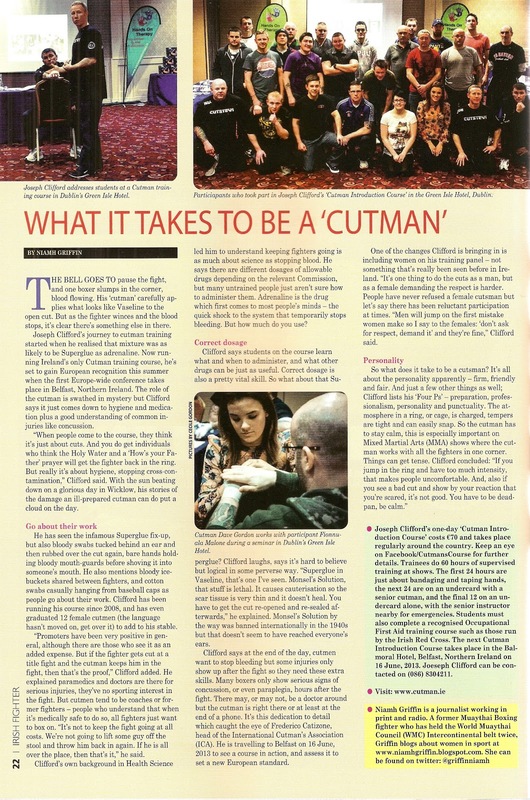 The next Cutman course is in the Balmoral Hotel, Belfast on Sunday June 16th. The one-day introduction costs €70 and takes place regularly around the country. This must be followed by 60 hours of supervised training.